Apple has agreed to pay a licensing fee to the Swiss railway network service after Cupertino was accused of ripping off its trademarked clock design for an iOS 6 app. The timepiece in question belongs to the Swiss Federal Railway (SBB), and hangs in train stations around the nation. 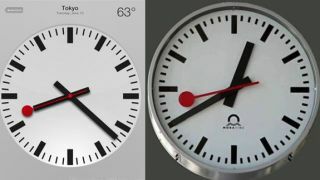 The clock is based on a 1944 design by one of its employees. When Apple launched the "identical" Clock app for iPhone, iPad and iPod touch, SBB said it was pleased the design had been recognised, but said Apple definitely did not for permission. "We are proud that this icon of clock design is being used by a globally successful company," Reto Kormann told The Associated Press on Sept. 21. "We've approached Apple and told them that the rights for this clock belong to us," he added, before saying SBB would be seeking an "amicable agreement" with Apple. It appears that the company got its lawyers on the case as Friday SBB confirmed that Apple has agreed to pay the piper on this one. SBB told CNET that the details of the agreement will remain confidential. Apple is yet to comment, but TechRadar has reached out to the company.